Hopes high of progress, it was disappointment for the host nation’s Sara Ramirez on the second day of play, Thursday 23rd November, in the qualification tournament that precedes the 2017 ITTF Challenge Spanish Open in Almeria. A former winner on the ITTF World Tour when she succeeded in Cairo in 2012, a stalwart of the national team for over a decade, she was the biggest name to fall as qualifiers for the main event were decided. She was beaten in six games in her concluding group stage contest by Nadezhda Bogdanova of Belarus (8-11, 11-8, 9-11, 11-5, 11-1, 11-7). First place against expectations for Nadezhda Bogdanova; there were also surprise first places for colleague Marhartyta Baltushite as there were for Austria’s Karoline Mischek, Japan’s Honoka Iwakoshi and Yumeno Soma alongside Korea’s Kim Danbi and Charlotte Carey of Wales. Alas for Yumeno Soma and Charlotte Carey there was to be no main draw place; required to compete in a preliminary round, Charlotte Carey was beaten by Honoka Iwakoshi (12-14, 11-5, 11-5, 10-12, 11-4, 8-11, 11-9); Yumeno Soma suffered at the hands of Kim Danbi (11-9, 14-12, 13-11, 11-5). Surprise first positions, in the Men’s Singles event notably the Spanish trio comprising Carlos Cabellero, Endika Diez and Javier Bento all upset the odds to top their groups, as did Kazakhstan’s and Denis Zholudev. Likewise it was pole position against the odds for Italy’s Jordy Piccolin, Sweden’s Anders Eriksson and Russia’s Vitali Murzin alongside Austria’s Alexander Chen. However, the most significant first place secured contrary to status was that achieved by Japan’s Kaii Yoshida; no current world ranking, he is twice an ITTF World Tour Men’s Singles winner and most recently a silver medallist at the 2017 ITTF Challenge Series Polish Open. Meanwhile, as play closed there were noteworthy performances. 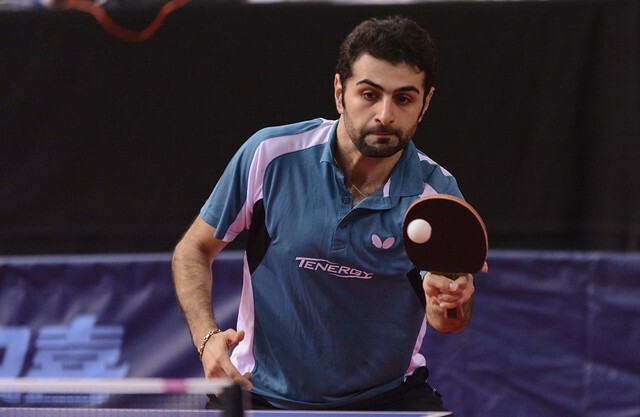 In the Men’s Singles preliminary round for players who had finished in second positions in their first stage groups, India’s Manav Vikash Thakkar and Manush Utpalbhai Shah attracted the attention. Both successful on this year’s ITTF World Junior Circuit, Manav Vikash Thakkar beat Congo Brazzaville’s Saheed Idowu (12-10, 11-6, 11-9, 12-10), Manush Utpalbhai Shah accounted for Argentina’s Nicolas Galvano (11-3, 11-8, 11-6, 12-10). Likewise in the Men’s Doubles and Women’s Doubles events there were eye catching performances. In the former, Austria’s Alexander Chen and Simon Pfeffer accounted for Italy’s Marco Rech Daldosso and Damiano Seretti (11-7, 8-11, 8-11, 11-7, 11-8; in the latter, Japan’s Satsuki Odo and Yumeno Soma beat the Belarus partnership of Alina Arlouskaya and Alina Nikitchanka (11-3, 11-8, 9-11, 5-11, 11-8). Play in the main event commences on Friday 24th November.